Republicans have reportedly found written evidence that proves the FBI found 'criminality' during the agency's 2016 probe of Hillary Clinton's email server. 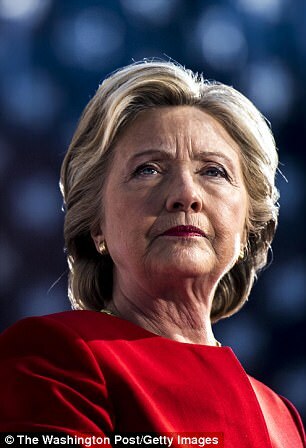 A new report by The Hill claims Republicans on key congressional committees have secured written documentation that the FBI believed there was evidence that some laws were broken when Clinton and her top aides sent classified information through her private email server. The evidence reportedly includes FBI documents stating the 'sheer volume' of classified information that was transmitted through Clinton's insecure server was proof of criminality. Then FBI Director James Comey sent a message to three top officials in the bureau on May 2, 2016, summarizing the position on the Clinton probe. The phrase 'grossly negligent' was critical as that is the standard which needs to be reached to bring a federal prosecution for mishandling classified intelligence. In other words, Comey was saying that she should be charged. But the language was changed on June 10 and the phrase 'grossly negligent' was replaced by former FBI agent Peter Strozk with 'extremely careless' - below the standard for prosecution. The memo then formed the basis for Comey's following statement on Clinton which said she would not be charged. Comey made the announcement that Clinton wouldn't be charged even though she and her aides had transmitted more than 110 pieces of classified information through her insecure email server, some of it at the 'top secret' and 'secret' levels. 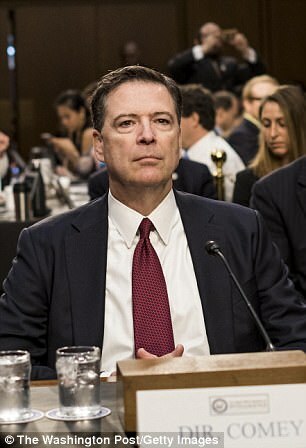 In June 2017, when Comey publicly sat before the Senate Intelligence Committee, to testify about his firing by President Trump, the ex-FBI leader explained how the infamous tarmac meeting between then-Attorney General Loretta Lynch and former president Bill Clinton compelled him to make certain decisions in the handling of the Hillary Clinton probe. Comey said at the time that he decided he needed to hold a press conference and announce that the FBI would recommend to the Justice Department that no charges be filed to 'protect the credibility of the investigation'. Prior to that, he was bothered when Lynch told him to call the Clinton investigation a 'matter' instead of an actual criminal probe, which it was. 'At one point, the attorney general had directed me not to call it an investigation but instead to call it a matter, which confused me and concerned me,' Comey testified. 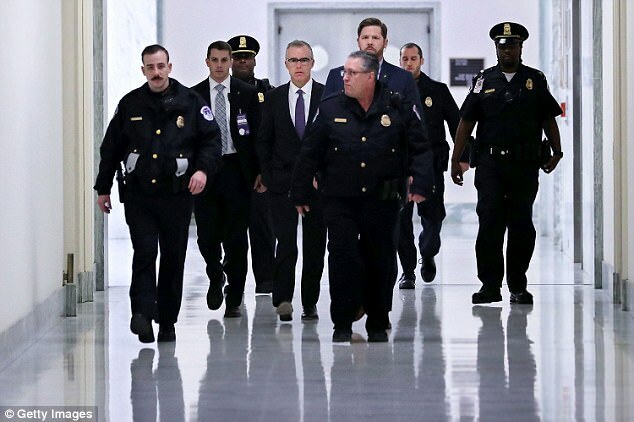 Lawmakers told the Hill that during the December House Judiciary Committee briefing with FBI Deputy Director Andrew McCabe, the bureau official confirmed that the investigation and charging decisions were controlled by a small group in Washington headquarters. After the briefing with McCabe, some Republicans were left convinced that FBI leadership rigged the outcome of the investigation to clear Clinton. Gaetz said he believes the FBI deviated from its 'normal objective practices' while investigating Clinton. Investigators told the Hill that the FBI began drafting a statement exonerating Clinton of any crimes while evidence responsive to subpoenas was still outstanding. 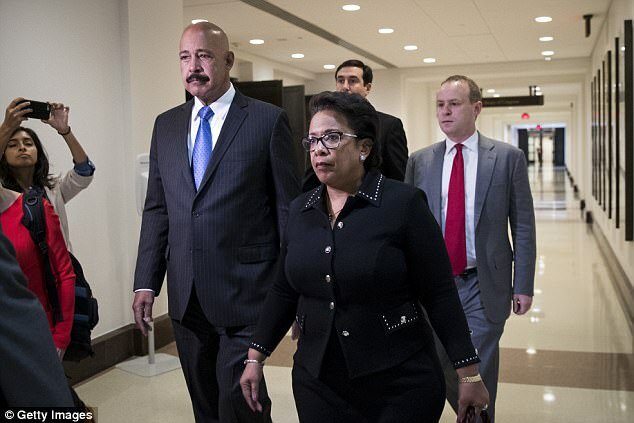 The statement exonerating Clinton was in the draft process before agents had even interviewed more than a dozen key witnesses, which is the most glaring irregularity investigators have found, according to the news site. 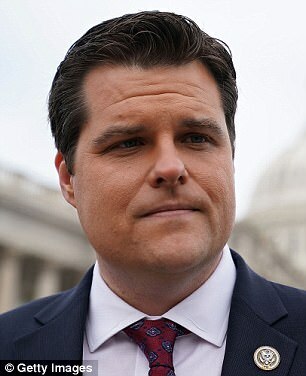 Gaetz said his panel has evidence the FBI took actions while writing the exoneration statement that required the Justice Department's input, such as immunizing witnesses in June 2016. A House GOP lawmaker told The Hill his staff also has identified at least a dozen interviews that were conducted after the drafting effort began, including of some figures who would have key information about intent or possible destruction of evidence. A senior law enforcement official told The Hill that the FBI 'did have evidence of statutory violations' but the decision not to prosecute was driven by a belief that there wasn't enough proof Clinton and aides intended to violate those laws or even knew they were violating them. 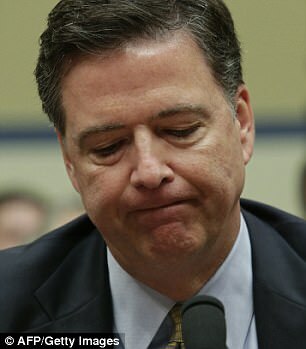 The official also acknowledged evidence gathering continued even as Comey began drafting the public statement, including the execution of an immunity deal on June 10, 2016, with Clinton advisers Cheryl Mills and Heather Samuelson that resulted in laptops with evidence being turned over to agents late in the probe. 'The leadership had a sense of where the evidence was likely headed and the idea was they would begin drafting their conclusions and if we found anything that changed that sense we'd alert them,' the official said. According to the Hill, there is also an admission of a false statement by one witness in the case. The witness, an employee of a computer firm that managed Clinton's personal server, admitted to permanently erasing an archive of Clinton's messages in 2015 after they had been subpoenaed by Congress. The computer technician was also granted immunity. The official said the decision to grant immunity to the Clinton advisers and the computer technician involved in the email deletions was made 'with the idea it would be better to know all the circumstances' before the case was closed out. Senate Judiciary Committee Chairman Chuck Grassley is working to try and determine whether the FBI investigated possible violations of the Federal Records Act, which required the preservation of all of Clinton's work-related emails. The FBI admits it recovered thousands of State emails that originated or passed through Clinton's private server. Some of those had been deleted and some were never turned over to the State Department. While the FBI believed none of those were deleted intentionally to keep them from the government, the Records Act allows for a misdemeanor charge in each instance where a government document is destroyed carelessly, investigators said. More answers should come to light in the first quarter of 2018 when the Justice Department inspector general is expected to release initial findings in the Clinton email case.